Honor has launched yet another entry-level smartphone, the Honor 7S today. The smartphone is a rebranded version of the Honor Play 7 that was launched a week ago. The complete specifications of the Honor 7S and Honor Play 7 are similar, including the selfie camera. The only change is the device will be sold as Honor Play 7 in China and as Honor 7S in Pakistan, while the Indian moniker & launch date are unknown at the moment. Honor might bring this device to the Indian market, considering that the company is looking for a decent market share by the end of 2018. Honor recently launched the Honor 7C and Honor 7A smartphones in India, which is another hint at this device’s launch in the sub-continent. The Honor 7S sports a 5.45-inch HD+ with a resolution of 720 x 1440 pixels which is layered by a 2.5D curved glass on top. Under the hood, the smartphone is powered by the quad-core MediaTek MT6739 chipset, clubbed with 2GB of RAM and 16GB of onboard storage. The highlight of the device is it boots Android 8.1 Oreo-based EMUI 8.0 out of the box. The storage in the Honor 7S can be expanded up to 256GB with a microSD card. Optics wise, Honor has added a 13MP sensor to the back of the phone, while on the front, there’s a 5MP unit. This device is backed by a 3020mAh battery, same as the Honor Play 7 and the company states there are various smart battery management facilities bundled inside the EMUI 8.0. 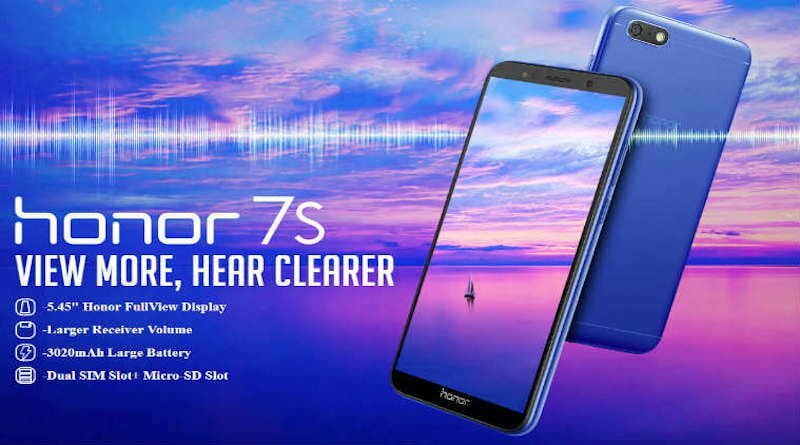 Honor has added various software features to the device to enhance the user experience, and it’s highlighting the earpiece on the device. The Honor 7S is limited to the Pakistan market for now, and it can be picked for PKR 14,499 (approx. Rs 8,400). If the smartphone launches in India, the price would be even lower, and it will be put against the likes of Xiaomi Redmi 5 and the newly launched Mobiistar XQ Dual.